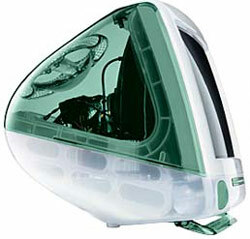 Announced in July 2000, the iMac DV+ built on the success of the iMac DV. The processor speed was upped to 450 MHz, and the hard drive was doubled to 20 GB, while the price dropped. The iMac DV+ came with 64 MB of RAM, a 56 kbps modem, Apple's Pro Mouse, and was available in Indigo, Ruby or Sage, all for $1299.